Thinking about it I really do have too many reflection shots on this blog – it’s becoming a bit of a habit! I’ve also got a lot of shots of these buildings (the former Royal Insurance Building) in my collection but they’ve most been taken when I’ve been trying to get this shot right. This is one of those shots that I’ve had in my head for a while and never managed to get it the way I want but on Tuesday we had just the right mix of clouds and blue skies, shame that the weather doesn’t appear to have held for the Bank Holiday. wow! amazing shot! 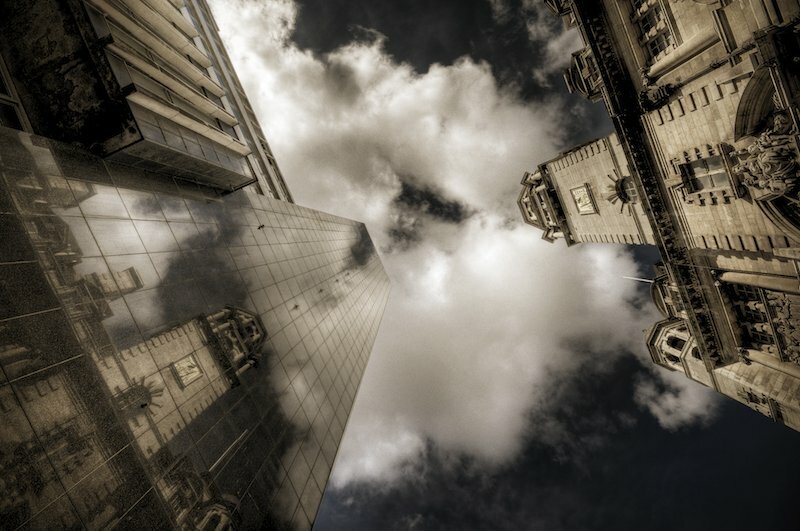 loved the tones, clouds and the reflection of the building very much! Nice angle and an impressing shot. I love this photo — the perspective really gets your attention and I am a sucker for reflections. Beautiful work! Really great shot – mighty impressive. The way that you’ve managed to grab the reflection really makes the photo.